Does your home have excess moisture? Do you find there is an unpleasant, damp smell in the air? If you’re suffering from too much moisture in your home, then you might be looking for a new dehumidifier. There are hundreds of models and styles of dehumidifier on the market so it can seem overwhelming. Take a look at some comparisons to help you choose. You might be looking for an appliance for your home, basement or garage. These three areas each need different specifications which are explained in our handy buyer’s guide that focuses on the popular brand Perfect Aire. But which is the best Perfect Aire dehumidifier? We’ve set out to give you all the information you need before making your purchase and give the most detailed comparison. 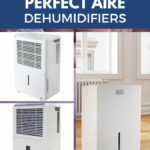 These Perfect Aire dehumidifier reviews set out the details, pros, and cons of different models so you can make an informed decision. Why Do You Need a Dehumidifier? Let’s Take a Look at a Few Models, Shall We? Re: My previous post about the 30 pint — we found the wheels inside the bucket. Do you have any information on the 30 pint? We just bought one but haven’t put the wheels on yet. We’ve never bought a dehumidifier that didn’t already have the wheels on.